Dr. Hitchcock: The importance of biometrics - and I wrote a whole chapter on in my book - I think is ultimately heading us towards the time when people are going to buy everything with their cellphone. We'll have radio frequency identification (RFID) encoded on a chip in our phones, and instead of having barcodes we are going to have RFID that will register what is being purchased so it can be automatically deducted. We won't have to go up and swipe or anything as the transaction will just automatically happen. Dr. Hitchcock: Yes, so this whole growing boom that is out there in biometric technology is the wave of the future. Biometrics will appeal to us on how it simplifies life and how much easier it makes things. 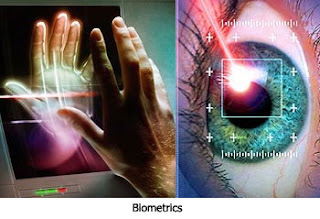 That is the way biometrics are going to be sold to people. Nathan Jones: What is beyond the cellphone, though, because really when you think about it, a cellphone can be stolen? You could get a thumbprint of somebody else and then repurpose it. Biometrics are not a fool-proof system. Identities can be stolen right out of the databases, bypassing biometrics. What technology beyond the cellphone do you think the Antichrist might use?